Every month Strictly Business Magazine provides over 10,000 subscribers with an ongoing picture of current business news in Lincoln, Nebraska, through in-depth feature stories, business leader interviews, and strategic commentaries. Your first issue should arrive within four to six weeks. 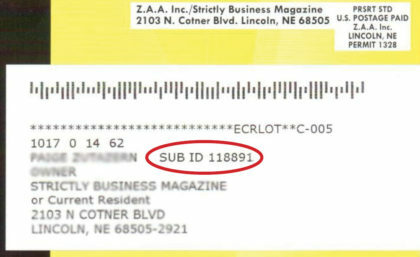 Please make sure that the shipping address that you provide is the address that you would like the magazine to be mailed to. please call us at (402) 466-3330 for a custom quote.